Once again there is no change at the head of the Premier Division supported by Sportsform league table following wins for the top four clubs on Saturday. For league leaders Renhold United that meant an extension of their unbeaten ways up to nine games and the retention of their 100% home record with a 4-2 win over a Sharnbrook side who have now failed to win any of their last eight league outings. Wesley Lewis scored twice alongside single strikes from Jordan Kumar and Ollie Housden against replies via Harry Atherton plus Shaun Barnett from the penalty spot. AFC Oakley M&DH remain just a point behind in second spot and now winners of their last six league outings after netting a 9-3 home win over bottom of the table Eastcotts AFC who have now lost their last eight league outings. Matt Barnes led the way with four goals and was joined on the scoresheet by Jack Hoogstraten, Mark Smith, Robert Heaney, George Cox and Alex Liburd against single replies from Xennon Paul, Dmarni Wilson and Danny O’Donnell for the visitors. Still in third are AFC Kempston Town & Bedford College who made it five wins on the bounce with a 5-0 home win over second from bottom of the table Elstow Abbey who are now on a six game losing run. Courtney Boughton led the way with a hat-trick including one from the penalty spot and he was joined on the scoresheet by Ashley Windridge and Michael Sexton to bring up the nap hand. Whilst fourth place Flitwick Town are still 100% at home this season and now unbeaten in their last eight starts following their 2-0 win over Ickwell & Old Warden, Will Scutt and Nick Atkins netting the goals to do the damage and end the visitors seasons 100% away record. Elsewhere, Wilstead claimed the biggest win of the day via their 7-0 home victory over Caldecote. Colin Marshall scored a hat-trick, Kevin Butler with a brace being joined on the scoresheet by an own goal and a strike from Michael Jones. Whilst Marston Shelton Rovers were 3-0 home winners over Sandy. James Burraway with a brace and Carl Borromeo netting the goals to do the damage. The seventh home win of the afternoon belonged to Shefford Town & Campton who returned to winning ways with a 3-2 victory over Pavenham, Jonnie Stratford netting twice and Jerome Mullings once against a brace in reply from James Owen. Cranfield United collected the only away point of the afternoon by sharing the spoils from a 4-4 draw at Ampthill Town Reserves. Phil Matthews, Chris Fenny, Connor Saunders and Ryan Perry were on the Town scoresheet against United replies via a brace from Jordan Appleton plus an own goal and a strike from Phil Kempsell. The top game of the day was to go the way of league leaders Stevington who made it six wins on the bounce to remain 100% at home this season by running out 5-3 winners over AFC Kempston Town & Bedford College Reserves. Ben Walsh with a brace was joined on the scoresheet by Reece Williams, Jordan Wright and Martin Danobrega against Town replies from Keegan Roberts, Chris Wright and Jessie Sidhu. The outcome not only saw the visitors lose their 100% away record but also second spot in the league standings after Sundon Park Rangers jumped above them by winning 2-1 at Potton Town to retain their own unbeaten ways. Chris Mapp and Matthew Conway were the Rangers goalscorers against a lone Town reply via James Pyman whose side have now lost their last four league outings to drop to ninth place in the league standings. Still unbeaten at home this season and now holding down fifth place in the league standings are Queens Park Crescents following their 2-1 victory over Henlow who now find themselves sitting in second from bottom position following this their fourth consecutive league defeat, Danny Rascol and Shazad Satter the Crescent goalscorers against one in reply via Oliver Cattley. Meantime, Riseley Sports enjoyed their first home win of the season by beating bottom of the table AFC Oakley M&DH Reserves 5-0. James Cooke with a brace was joined on the scoresheet by Jack Healy, Samuel Harrison and Jake Hislop to bring up the nap hand and leave the visitors now seven games into their season still looking for their victory. Whilst Meltis Albion returned to winning ways with a 4-3 home win over Westoning. Sam Child shooting the visitors ahead after just four minutes which was quickly cancelled out by a Carl Townsend header two minutes later to take the teams in at half-time all square at 1-1. Within three minutes of the restart Ashley Drummond had headed the Albion into a 2-1 lead but just like in the opening half things were all square again within two minutes via a visitors strike from Oilver Mansfield. However, Ashley Drummond was to be the day’s match winner netting again in the 63th and 72nd minute to complete his hat-trick and take the Albion 4-2 clear before substitute Lewis Cooksley netted the afternoon’s final goal just two minutes from time to make it 4-3 at the final whistle. The day’s final game saw Houghton Athletic and Shefford Town & Campton Reserves play out a 0-0 draw. The point was enough to lift Houghton out of the relegation zone at the expense of Henlow. Lea Sports PSG are now up into second spot in the league table and within two points of league leaders Cranfield United Reserves following their 7-0 home win over Kempston Athletic. Joe Hennem with a brace was joined on the scoresheet by strikes from Ryan Darby, Sean Dixon, Richie Randall, Jordan Yearwood plus an own goal. Whilst Wootton Village lifted themselves out of the drop zone in claiming their first win of the season in a 5-0 success at Elstow Abbey Reserves. Sahil Hamza with a hat-trick joined on the scoresheet by Sam King and Aaron Williams to bring up the nap hand and leave the Abbey still looking for their own first win of the season. Sundon Park Rovers retained their unbeaten away ways to remain in second spot in the league standings with a 2-0 victory at Shefford Town & Campton A who were thus losing their own seasons 100% home record. Carl Williams and Shane Roberts scored the vital goals. Whilst AFC Dunton retained their seasons unbeaten home ways to climb above Dinamo Flitwick into third spot with a 6-0 win over them at Horseshoes Close. Dean Hill with a hat-trick, Tony Norman with a brace plus an own goal marking the home scoresheet. 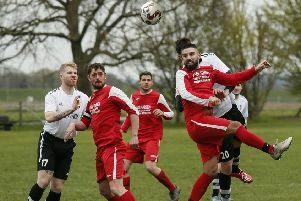 Polonia Bedford are now the new leaders of the division four league table after they made it five wins on the bounce to retain their 100% away record by winning 3-0 at bottom of the table Lidlington United Sports, Marian Sobczyk netting twice and Przemyslaw Stramski once to do the damage. Whilst Staughton missed the chance to take over second spot when being defeated 4-2 at Bedford Albion who were duly collecting their first home points. Dan Jeffries with a hat-trick plus a single strike from Shaun Challi only being replied to by Lucas Banton and Scott Boswell for the visitors. Bedfordshire FA Junior Cup Round Two. Well at Groveside, Henlow Reserves had just a Robbie Angell goal to show for their 1-10 home defeat by Stevington Reserves whose goals came via five for Cameron Cain plus single strikes from Jamie Endersby, Aaron Fletcher, Sam Nightingale, Saxon Taylor and Kai Smith. Caldecote A were toppled 5-2 at home by Wixams, Gaz White with a brace joined on the scoresheet by Jonny Cockram, Matt Harris and Iain Hall to bring up the nap hand against home replies from Rafe Goodman and Paul Rannow. Whilst Wilstead Reserves were 7-1 victors at AFC Kempston Town & Bedford College A. Callum Evans with a hat-trick, Luke Pursey with a brace joined on the scoresheet by Pas Altieri and Sam Ward against a lone Town reply via Rahui Lol. 100% so far. Over at Whiston Crescent giant killing number one saw Clifton run out 2-1 winners over Marston Shelton Rovers Reserves thanks to goals from Charlie Watson and Jonny Cole against a lone reply from Peter Kerr, and at Harvey Close, Caldecote Reserves were 4-0 home winners over Bedford United, Tom Dupey netting twice alongside single strikes from Simon Ashton and Adam Legate to claim giant killing number two and still leave the preview 100% . Elsewhere, Kempston Hammers Sports were 4-0 home winners over Renhold United Reserves via a Shaun Winconek hat-trick and a single goal from Minde Siburkis. Whilst both Flitwick Town A at home to Cople & Bedford SA and Westoning Reserves at home to Clapham Sports failed to raise sides to meet their higher division opponents. So there you have it 100% for the preview. Away from the all Bedfordshire County Football League ties it was a mixed day for our teams. On the bright side, Atletico Europa with goals from Mo Banda, Serge Kadji and Tadej Jaukovic were 3-1 home winners over North Bucks League side Southcott Village RA Reserves and Cranfield United Reserves with strikes from Luke Gray and Ben Thompson to win 2-0 saw off Luton District & South Beds League Brache Sparta 2015 Reserves at Crawley Road. Whilst on the road there was another two victories over Luton District & South Beds League sides. Flitwick Town Reserves won 6-1 at FC Kokan where Scott Gadsden and Dean Gadsden both netted braces to go alongside single strikes from James Joyce and Ben Stones and a lone penalty strike in the 13th minute from Rafel Cygan was enough to see White Eagles win 1-0 at Luton Leagrave. However, there was a downside. Sandy Reserves having just a goal from Antony Roberts to show for their 6-1 home defeat by Aylesbury & District League FC Spandits Reserves. Whilst both Mid Beds Tigers and Meltis Albion Reserves went out on penalties to Luton District & South Beds League sides. The Tigers at FC Polonia Luton 5-4 after 90 minutes play had seen the teams all square at 3-3. Liam Brophy, Luke Rudd and Luke Clark on the Tigers scoresheet and the Albion 4-2 at Luton Aces after 90 minutes play had seen the sides all square at 3-3. Steven Stafford, Sylvester Mulenga and Raj Surinder the Albion goalscorers.